This thought-provoking book examines the clinical dilemmas faced by therapists who, for a variety of reasons, are working with involuntary or reluctant clients. These individuals often come to therapy through the judicial system but might also be problem employees or spouses persuaded to enter therapy by their mates. Under these circumstances, working together can be frustrating for both therapist and client. The typical therapist's skills of reflecting, probing, and supporting often fail with individuals who did not enter into therapy of their own accord--or who, once there, do not engage readily with the therapist. The inquiring approach to therapy, with its frequent questioning of the client, can have an unwelcome and intrusive quality for poorly motivated clients. Stanley Brodsky demonstrates how therapists can tailor their interventions to avoid impasses, build a firm alliance with the client, and help him or her develop more productive behaviors. Specifically, Brodsky proposes that therapists adopt a variety of techniques that largely avoid asking questions. Instead, he shows how therapists can make assertive statements about what is happening in the client's life, identify behaviors, and describe choices the client might make. 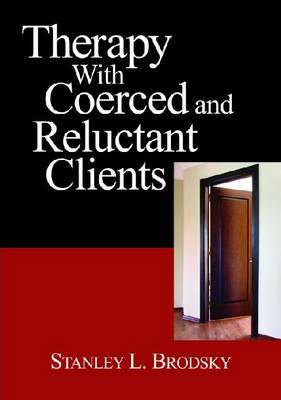 Through the use of case material, the author demonstrates that interacting creatively with reluctant clients can lead to significant breakthroughs. The provocative ideas in this book will be welcomed by therapists and counselors who work with offenders, probationers, involuntarily committed patients and, more broadly, other clients who fail to make progress.